The new Kantei incorporated a variety of measures to improve functionality from environmental and barrier-free perspectives. 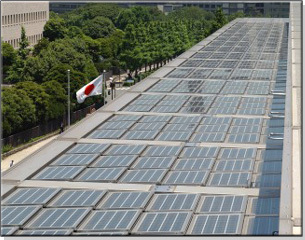 With regard to environmental measures, many hundreds of solar panels have been installed on the north-south running eaves of the Kantei roof with the intention of actively utilizing natural energy, and these solar panels are used as a source of supplementary electricity. A rainwater usage system has been installed to use water resources effectively and rainwater falling on the roof is collected in underground storage tanks and used in the toilets and on the gardens of the Kantei. As measures to create a barrier-free environment, a gently sloping escalator has been installed that can accommodate wheelchairs, with a wheelchair-settler which folds out through a simple push-button operation. In addition, for the convenience of persons in wheelchairs, there are no split levels on any floor, and toilets have been installed that are of adequate size and equipped with handrails. Other considerations include the installation of Braille blocks on the floor for the sight-impaired and Braille signs, which are also present in the elevators.